Before this day ended, I’ve received an email from LinkedIn which came as a surprise, my account is listed among one of the best LinkedIn profile there is! Of course, I’m just kidding. 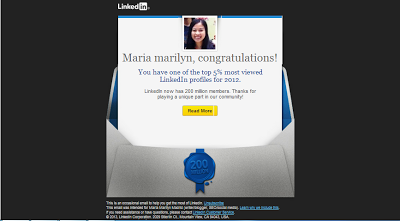 But my profile is at least among the top 5% most viewed profiles for 2012. See image below. This is most likely because all my freelancer accounts link to LinkedIn to showcase my complete writing portfolio. I’ve also filled out almost every information needed by the site, most especially the ‘skills’ section. In other words, my account is fully optimized for its potential. Although I’m not good at Math, I’ve found out that 5% off the 200 million members of the site is equivalent to 10 million. That’s still a significant number for me and I’d like to consider it an achievement. So how about creating and then adding ‘LinkedIn Profile Optimization’ in my list of services with my own account as a sample?